One of the simplest ways we can help animals is by changing what we put on our plates. But simple doesn’t always mean easy, especially when it comes to changing the way we eat. Food is cultural, social, and emotional. Our diets are influenced by health and psychology, and by what’s available and affordable. And, of course, taste. If we’re not familiar with a dish or don’t know how to make it, we’re not as likely to eat it. There’s good news, though: You don’t have to do it all at once. You can start small by switching out one ingredient, like using plant-based milk instead of dairy. Or you can start with one day a week…let’s say Monday. The beginning of the week is always a good time to shake things up a bit. Meatless Monday: Learn more about the movement, who’s on board, and recipes to help you start off your week meat-free. The Green Plate: Meal planning, personalized coaching, and an online community from Mercy for Animals will support you whether you’re thinking about trying your first veggie burger or have been vegging for a while. Try Veg: Compassion Over Killing has a free guide to get you started, recipes, and tips to veganize everything from Easter baskets to classic comfort foods. VegCurious: If you’re not sure what to do with your veggies, but think you want to do more, this could be the no-pressure resource for you. Plant-based on a Budget: You can eat more plant-based foods without breaking the bank, and this site is full of money-saving, animal-saving meal ideas to show you how. The Vegetarian Resource Group: As the name implies, this is a virtual clearinghouse of veggie info. What are your favorite resources for plant-based eating? Let me know @sfeldstein or use the #meatlessmonday hashtag. 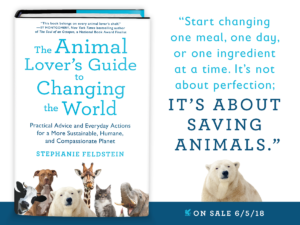 For more tips and resources on animal-friendly eating, check out THE ANIMAL LOVER’S GUIDE TO CHANGING THE WORLD.